Home » Latest News » How Can It Be 50 Years Ago Today? How Can It Be 50 Years Ago Today? 50 years ago, on August 18th 1965, Ronnie Wood and the Birds recorded their third single, ‘How Can It Be?’ The song now lends its name to Ronnie’s new, signed book and vinyl boxed set. 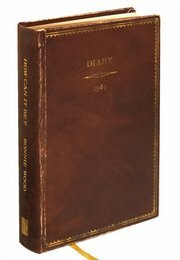 Ronnie Wood has reimagined his original composition to accompany his 1965 diary, which he embellishes with entertaining commentary and illustrations. Ronnie recorded the 2015 version of ‘How Can It Be?’ at British Grove Studios, and the finished track will be pressed on a limited edition picture disc of just 1,965 copies. To secure your copy of HOW CAN IT BE? A ROCK AND ROLL DIARY, click here. 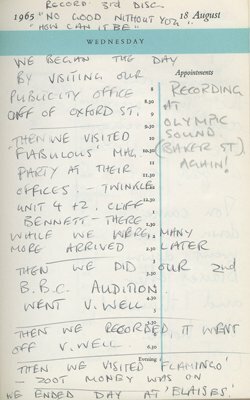 Pictured left: Ronnie Wood’s diary entry for August 18th 1965, which also references Cliff Bennett, Twinkle and Zoot Money, along with legendary clubs Blaises and the Flamingo.